Ilgaz Mountain National Park is 45 km in the south of Kastamonu, and 200 km north of Ankara (the capital city of Turkey), and lies in the Central Anatolian region. The National Park can be accessed from the Cankiri – Kastamonu highway. Ilgaz Mountain National Park, announced in 1976 as a national park, covers of 1118 hectares. The land is usually formed by schists and volcanic rocks . 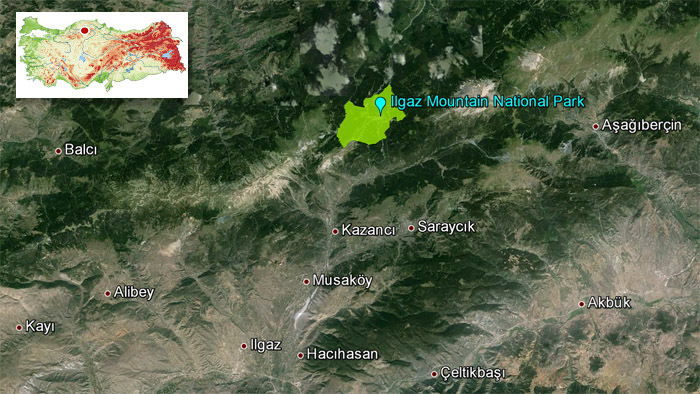 The Northern fault line which is the longest and most dynamic fracture line of Anatolia passes through the southern foothills of the Mount Ilgaz. In winter it attracts winter sports and ski enthusiasts, while in summer people come here for trekking and camping. Ilgaz Mountain National Park is a natural wonder covered with forests. 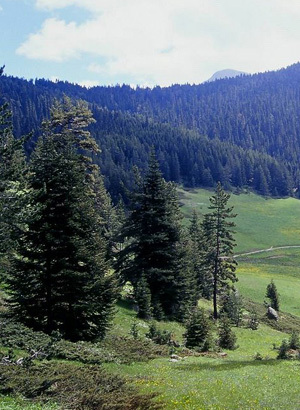 The Mount Ilgaz not only has a rich and dense flora, it also shelters a large number of wild animals. Within the National Park there are valleys, ridges and peaks in different characteristics. Ilgaz Mountain National Park area which has a Geomorphological structure is covered with a vegetation formed of red pines, fir trees. A variety of very rare flower species in the world are also raised in the National Park. There are animals such as roe deer, wild boars, wolves, bears, foxes live in the park with flowing rivers. Ilgaz Mountain National Park is also very convenient for winter sports. An 800 m. Long ski slope and 1500 m long s two chair lifts and telex facilities available in the Ilgaz winter sports tourism center. Mount Ilgaz has three ski runs of 750, 1000 and 1500 meters. It has a 1000 meter chair lift and a 750 meter baby lift. Its modern accommodations make Mount Ilgaz an ideal place for those who are keen on winter sports. Ilgaz Ski Centre is in Ilgaz National Park where it is located at 2850 m altitude on the Ilgaz Mountain Range between Kastamonu and Çankırı provinces border. Ilgaz Ski Centre, besides winter tourism, is also available for four season tourism with its beautiful scenic views. In Ilgaz Ski Centre the ski season begins at the beginning of December and lasts till the month of April. There are 3 facilities in Ilgaz Ski Centre. The Ilgaz Ski Centre and Ilgaz Hotel Region are covered by fir and yellow pine trees. In addition to skiing, it is also possible to trek and camp, and visitors are allowed to fish in the trout farm and ponds in Baldiran Valley between 15 June and 15 September, as well as buying fish from the farm. There is a hotel, an administrative museum, an educational establishment, and ski lift for winter sports. Fishing ponds and trout farms can be visited in the Karasu river located in the Baldiran valley with in the borders of Ilgaz Mountain National Park. Activities in National Park; nature photography, exploring rich flora, mountain and winter sports, trekking, hiking and camping, picnicking.